38/7.2. When a heavy stone falls on a man and holds him down, it is sufficient to say the stone rules over the man. If an epidemic comes upon a city because of uncleanness, it is well to consider that cause also. Nevertheless, if an epidemic is periodical to a certain city, even when the city is not unclean, it is wise to look for an unseen cause. The same rule applies in comparing one locality with another. 38/7.3. In certain regions of the earth, certain diseases are common; at certain times of the earth, in cycles of three thousand years, certain diseases were common. In certain places of the earth, man has at times, thousands of years ago, attained to great knowledge and virtue. But his whole country in later centuries became a wilderness. 38/7.4. It is not the place of a prophet to account for these things by accusing ignorance or war. The prophet must account for that tendency in man to fall into ignorance and into war. In other words, he must find the cause of causes. 38/7.5. At certain periods of time, for hundreds of years, nations have dwelt in peace, and have risen in virtue; then turned to war among themselves and gone down in death. 38/7.6. The prophets of old divided time into cycles of three thousand years, with slight variations. And they found that at the beginning of these periods of time, a certain impulse came upon the people, causing them to try to be better and wiser---even as the same feeling is manifesting itself this day in many nations. 38/7.7. The scale then rises for four hundred years, more or less; and, after that, wars and epidemics come upon the people. They then begin to decline, especially in virtue and peace, but the general intelligence suffers little for about another six or seven hundred years. After which time, they destroy their libraries and records, and reduce themselves to ignorance and vice. Then a darkness follows of one thousand or more years, with slight intermissions. And after that, for six hundred years the corporeal senses [intellect --Ed.] begin to ascend. Self‑conceit comes upon them; they think they are the beginning of wisdom on earth. Then comes another cycle of light. Angels descend from the unseen worlds. New revelations crop up in every quarter. Inspiration comes upon mortals, and they go to the opposite extreme, becoming superstitious and obedient to unseen influences. 38/7.8. Such, then, is the general character and behavior of man during a cycle (dan'ha cycle). And he rises and falls in all these particulars as regularly as the tides of the ocean. 38/7.9. These revelations are chiefly made so that man can begin to comprehend these things, and learn to classify them so as to rise in wisdom and virtue, and thus overcome these epidemic seasons of cycles. 38/7.10. As previously shown, there are positive and negative forces continually going to and escaping from the earth. Without these no creature could live on the earth. The negative imparts to man his corporeal growth, as well as his corporeal desires, passions, and so on. 38/7.11. According to the quantity and quality of the corpor solutions in the firmament and their precipitations to the earth, so will man be affected and inclined to manifest. These influences are easily discernible by some persons. One is depressed by a dull day; another inclined to drunkenness and fighting. A bright day inspires man with energy. 38/7.12. A su'is is so susceptible to vortexian currents, he can realize the qualities of a medicine while it is yet in a glass bottle, by merely holding it in his hand; or know the character of the writer of a letter by holding the letter in his hand. Yet all this is accomplished by the vortexian current of the article in question. 38/7.13. These revelations however are not in reference to individuals, but to nations and peoples, in periods of time embracing hundreds of years, and thousands of years. 38/7.14. It is an error to say that while the corporeal worlds are organized, with fixed orbits and uses, the unseen worlds are nothing, or at best not organized. They are organized, with orbits, places, forms, figures, and so on, as definitely as the corporeal worlds are. Their times and seasons are regular and well provided. 1682 For perturbations affecting conditions on earth, see image i102, image i101; (with text). 1683 And, so he also may gauge the effects of unseen causes, so that beneficial action can be taken. || Note regarding unseen causes, that the beneficial action taken by man may be augmentative, preventative, or palliative, depending upon the nature of the cause and the existing expertise of man; for, of course, some unseen actions, including periodic actions, are deleterious while some are beneficial. i104 Serpent. 1, Sun. 2, Mercury. 3, Earth. 4, Mars. 5, Artaea. 6, Vesta. 7, Ceres. 8, Jupiter. 9, Saturn. 10, Uranus. Equivalent: Koo, 28. Sai'Lee, 44. Pisc, 22. Hoo, 85. Frgabal, 114. At'bars, 8. Gii'S'Smak, 198. 38/7.16. It is not the purpose of these revelations to work out prophecies, leaving nothing for man to do. But to call his attention to the unseen forces that rule on the earth, and show him the way to make the prophecies himself. 1686 Recall there are seven dan spans for a dan'ha cycle (04/7.19). Therefore the 'end cuts' numbers one and eight represent the hi'dans (initial harvest points), and cuts two through seven represent the dan harvest points. 1687 Thus instead of percentage, which is based on a scale of one to a hundred percent, we have millage, which is based on a scale of one to a thousand per mill. i083 Orachnebuahgalah. The Tablet of Prophecy; the Crescent Tablet; being a map of light and darkness, the times gone through or coming, and the good and evil expressions of man. 2274 and 821---Seven changes, i.e., Howt, oat, bun, lis, vu, mi and ruth. 4750---Nista, six changes, i.e., wuts, norse, rue, wi, rill and goe. 1060---Two changes: Aont and foe. 1768---Four changes: Mathai, yam, luke and jon. 1245---Eight changes: Woo, gosa, lo, galeb, nor, nu, dhi and yun. 1790---Six changes: Loo, chong, ouk, chan, clips and wis.
108---Two changes: Yissain and C'tarin. 3644---Twelve changes: Yats, rope, sum, div, hong, ras, rak, nir, |1689| yute, theo, ike and mar. 1746---Eleven changes: Zi, yu, che, gow, rom, luts, wang, said, do, gos and yun. 3601---Three changes: H'ak, ghi and kong. 47---Three changes: Sim, Will and loo. 9278---Four changes: Lai, bom, ross and fur. 326---Eight changes: Wahes, Yine, Seb, Dhi, Yeniv, gan, li and rak. 2340---Twelve changes: Mark, hiss, thor, bess, lin, triv, gam, zet, howd, saing, tum and gowtz. 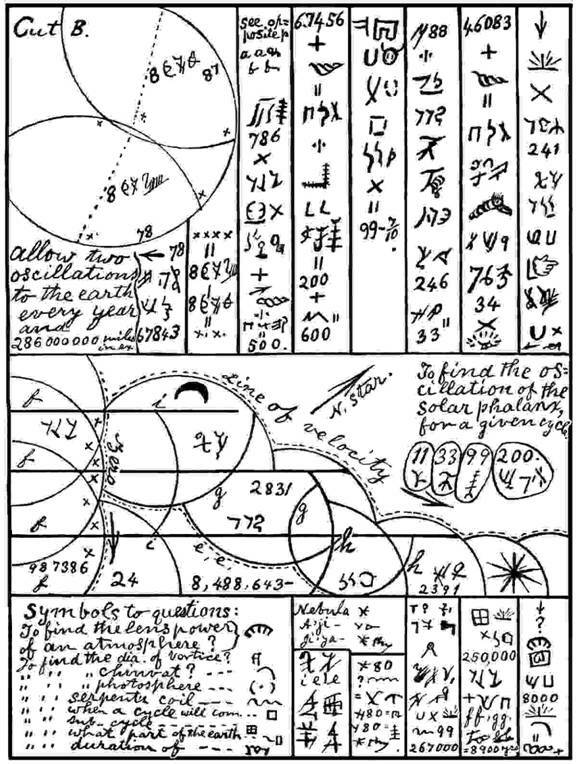 1688 The student is referred to Saphah for interpretation of the symbols. --Ed.